Shower. Or bathe. But do it without your washcloth and loofah. Sounds bizarre, but please, cleanse with your hands, and of course, a great scrubbing beauty product. We couldn't make this stuff up, but we have learned from two of the best skin experts in the business---Dr. Michelle Copeland and Marcia Kilgore. And lastly, Dr. Copeland, do you have a favorite skin care tip? One that doesn't involve your skin care line? "Loofahs and washcloths are the bane of my existence. You never want to break the normal skin barrier, and that is what loofahs do. I have told many patients to lose the loofah, and they flat out, will not do it. I'm not ordering you to throw away your loofah because I want to torture you. It's an issue of cleanliness and abrasion. Think about how warm and steamy your bath gets, particularly around your tub. As we all know, bacteria and fungus thrive in hot, moist climates. Skin is our body's natural protective blockade. You don't want to compromise it," she explains. "The small abrasions caused by harsh scrubbing, aren't visible to the naked eye, but they are plenty big enough for germs, bacteria, and their counterparts, to slide right on in and set up shop." "Exfoliation should be a regular feature of your body and facial routine all year round. Incorporate a body exfoliator into your shower routine at least three times weekly to slough away dead skin cells quicker. Not only will it simultaneously stimulate circulation, your after-shower moisture lotions will sink in more readily. And by the way, just say no to loofahs. Once used, they are loaded with bacteria build-up," Marcia Kilgore explains. Sure, exfoliation is key in good skin care, but these experts want you to use an effective scrubbing beauty product. And both women offer some wonderful shower and bath products that aggressively remove dead skin cells, but do it in a gentle formula. 1. Dr. Michelle Copeland Bath/Shower Gelee ($36, 7 oz.) "Using green tea extract—a powerful antioxidant to replenish the skin—it also gently exfoliates and stimulates new cell growth. Non-drying and enriched with soothing aloe! " 2. 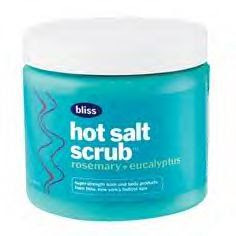 Bliss Hot Salt Scrub ($36, 12 oz.) "All-over sea salt body scrub is oil-free, super-softening, self-heating and spiked with eucalyptus and rosemary oils. It's the ultimate do-it-yourself spa-strength skin smoother. " Seriously now, ur telling me that we must use only our hands while showering? I can't...that is way to gross. I need my washcloths. I use my hands when washing and only use a washcloth before bed to wash my face it's not gross!